For more information go to Themes by bavotasan.com. Thanks for another great looking theme. You need to add the CSS section to Magazine Basic too. It is an great option to have. The title goes out of line when you select 1024 width and right alignment. Any solutions? I have just updated the theme to version 1.0.3 and that should fix that issue. this is a new awesome Theme from you! Thx a lot! But I have the same Prob as in Magazine Basic. 1024px and 800px is to width for me. Have a Scrollbar unter the Site. Look your self. Have you an Solution for me? That happens because your browser window has a scollbar to the right, which takes up space. So now a 1024 width site on a 1024 inch monitor gets a scrollbar at the bottom. You can open up the functions.php file and do a search for the term “1024” and just replace it with “1000” or less. A little theme but great work. WOW! GREAT theme! I just had to write a post about it. Will have to add it to my theme previews. Love the theme, but the moment I launched it, the wp-admin pages broke! Now, it’s just showing “can’t open file”. Any suggestions? Try version 1.0.7. It should fix the problem. Hi, I’ve translate to spanish all php files. You can see how it looks on the website I submitted on website field. This is just a starting blog, few posts, no links yet. Hi your theme has great features I love it! I’m new to this wordpress stuff and I have been constructing my portfolio site. I was wondering, is there any way to view sub pages? I made a parent page and then sub pages but I couldn’t find a way to navigate to them. Right now the theme only displays the parent pages and no sub-pages. I might be able to figure that out for the next version. Loving the theme, definitely! I was just wondering – is it possible to get more than one image showing on the front page, so that the visitors don’t have to click on each post to see them? I often have more than one picture in my posts, and I want them all to show. Go into Snowblind => Layout and choose Content and turn off the Content Image Resizer. The theme is great so far. The best one i’ve found for sure in terms of it functionality and ease of use. I was wondering if there was any way to show excerpts in the Category view. The front page shows them fine, but when you click a category it extends all the posts out, I don’t want it to do that. I have the “show excerpt” box checked in the Snowblind settings and I have the “Show Summary” box checked in WordPress. But it’s both only for the front page. Any help greatly appreciated. Thanks for the great theme! Open up archive.php and look for line #26. You can replace the 55 with a lower number. That is the number of words displayed. Also, What’s a simple way of inserting an image in the header? Use the Header Uploader in the Snowblind admin panel. If you have problems make sure the theme’s uploads folder has full write permissions set. I love this layout. I would like to leave the header text as it is, BUT add a small image to the right hand side. However, every time I upload the image, I lose the text. How can I add an image to the header without losing the text? You would have to hard code that into the header.php file next to the blog name function on line 53.
hello.. i am new with wordpress.. the 1st thing i do when changing to wordpress is find a new themes and i choose snowblind because it is easy to configure and i really2 like it.. however i have some problem. 1) why my post time repeated 2 times? like this..
2)how can i show full text for every post at main page? i mean how to remove the “continue reading>>” ? Nice layout with high contrasts – easy to read and simple structure! Are there any plans to update this theme for WordPress 3.0 compatibility, or have you moved on to bigger and better things? So I’m noticing this theme is no longer on wordpress.org. I had it on my list of themes to test, but can’t find a download now. What’s the deal? I just love wordpress and I have some list of themes and thanks for such a wonderful free wordpress themes. An excellent theme I had ever seen and thanks for the demo. where i can download your theme snowblind, cos i already used it once? it’s great! Click on the download link above and it will lead you to a page on Themes by bavotasan.com where you can download the theme. I am looking forward to your update for wordpress 3.0. It would be a pity for such a nice theme. 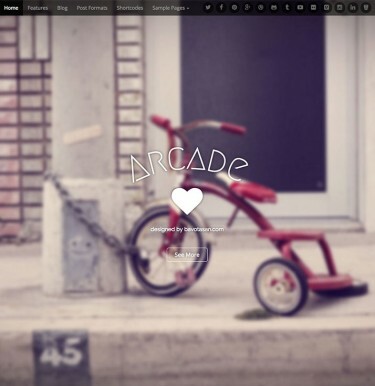 Excellent WordPress theme. Easy to instal and a joy to use. Thankyou Bavostan! I’m seeing an update for a 1.1.5 version of Snowblind (in WordPress), but can’t find info on it. Anybody knows what’s new ? Did you go to Themes by bavotasan.com as suggested above to get more info? Hi your theme has great features I love it! Thanks for another great looking theme. Excellent WordPress theme. it�s great! I often have more than one picture in my posts, and I want them all to show. this theme is really looking and also working great. The theme is great so far. The best one i�ve found for sure in terms of it functionality and ease of use. This is an awesome looking theme C.Bavota. Well done. And I wish a lot more admins would communicate with their readers and support them, the way you do it on your site. Keep up the excellent work. I will definitely come back to read more posts. A really great theme! Thanks for sharing it. Thank you very much for your free WordPress themes, Bavostan. When i click on the demo button i takes me to the arturo theme…very inconvenient.. or i’m i doing something wrong Bavotasan? It is fixed now. Thanks. The Theme is great and easy to navigate. I just have one question, I’m not sure if I’m the only one who experience this that in the sidebar the recent post, categories, tag clouds etc are un-clickble or no link using Chrome 9 and Firefox 3.5 but in IE 8 is it working normally. Can you provide a live link so I can take a look? I really like this simple black&white templates. Maybe I like to use it for my next blog ! I love this really nice theme. Nice layout with high contrasts � easy to read and simple structure! Great work -> Nice done! All I can say is Awesome Theme. the moment I launched it, the wp-admin pages broke! Now, it�s just showing �can�t open file�. Any suggestions? How did you upload the theme? There might have been a problem during upload and some files didn’t install correctly. Also, just to double check, what version of WordPress are you using? I really appreciate your work and thank you for this very nice theme. Superb theme. Is it avalable in German too? Excellent theme! Thank you, Bavota.